Try it and you always love it! Chai Kapi Services is the go-to name in India when it comes to vending premixes. 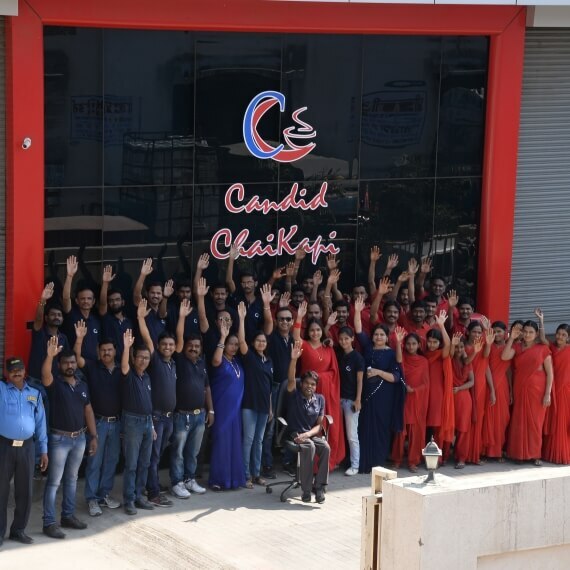 Established in Pune with a branch office in Mumbai, we have a strong distributor network across the length and breadth of the country. 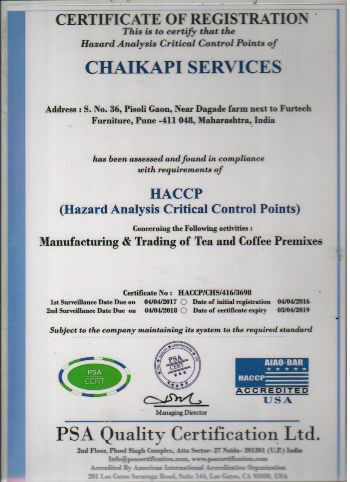 All premixes produced by us are made in our HACCP and ISO certified facility with state of the art machines and super skilled team force. Our exports to the global market give our products the quality validation. 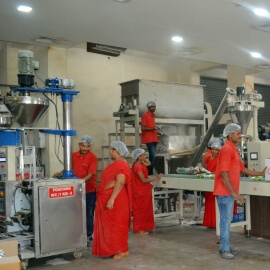 Besides premixes and premix vending machines, Chai Kapi also supplies Bean to Cup and Powder to Cup fresh milk machines. 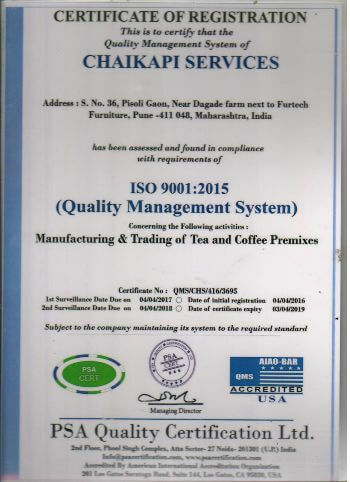 We work in the manufacturing and distribution of tea and coffee vending premixes. Additionally, in the last few decades, we have made our mark in over 15 countries of the world in the Middle East, Africa, and South East Asia. We are supported by 40+ distributors in the global market. Chai Kapi supplies to multiple segments of the market from corporates to educational institutes, and entertainment hubs to call centers. We customize our products according to the customer’s requirement and undertake OEM supplies as well. This helps us to serve our customer better. Customer satisfaction and a no-compromise policy in production quality our core values. Do you travel to the Middle East often for work? Then you have probably have tasted our product. We take pride in saying that two out of every three tea/coffee cup in the Middle East, is a Chai Kapi product. We have been extensively supplying to various countries in the Middle East Africa, Nepal & Pakistan through our strong distributor network. Copyright © Chai Kapi 2018. All Rights Reserved.